Rune Factory 4 and Why You Should Buy It. First of all, do you have a 3DS? Do you? If you do not, run and get one. They (as in all the major retailers) have tons of pretty ones out now. In addition to all of the incredible games that are being released for this system and you are just friggin’ missing out! I suggest getting this little beauty. If you’re worried about the 3D and how you refuse to play any games that make you use 3D, there is a little slider on the side of your 3DS that will disable or enable the 3D. Now that the seed of want has been planted, let me being this glorious review. Rune Factory 4 is by far the best Rune Factory game to date. If you enjoy role playing games, you’ll definitely love Rune Factory series. The premise of the game is rather similar to every other Rune Factory game. However, this time, you get to choose your gender. I, naturally, went with being a male (since, you know, I am a female and girls are just way more fun to seduce than boys!) although, having the choice made it a bit more exciting. As I was saying, you are a person of either gender who is somehow struck with amnesia and now you must farm/capture monsters/dungeon crawl/craft your way into the hearts of your fellow citizens.There is a bit more to the story than that, but I’m not going to spoil anything other than DRAGONS. Unlike other harvesting games, like Harvest Moon (which I LOVE and will review later on) Rune Factory 4 has a more sophisticated dungeon crawling system and an entirely different method of “raising” farm animals. In this game, you capture monsters. These monsters will have a particular ability depending on which type you capture. Some will be able to help you with the harvesting, others will produce materials, and all of them can assist you in battle. You still have to raise your friendship with these pets, much like every harvesting game. If you like crafting in games, Rune Factory 4 is all about your type of people. In order to progress in the game, whether it is romantically, or through dungeon crawling, crafting is required. Dating is another bit that is done incredibly well in this new game. This time, you can romance more than one partner at a time! You can date various people! If you like experiencing most of your dating prospect stories, this game allows you to do this (be warned, you will have to deal with some jealousy). There is so much this game has to offer. It is the epitome of what a role playing game should be and it aims to please. It is not incredibly difficult. You won’t find yourself feeling that horrible sense of regret after hours of playing and getting nowhere. 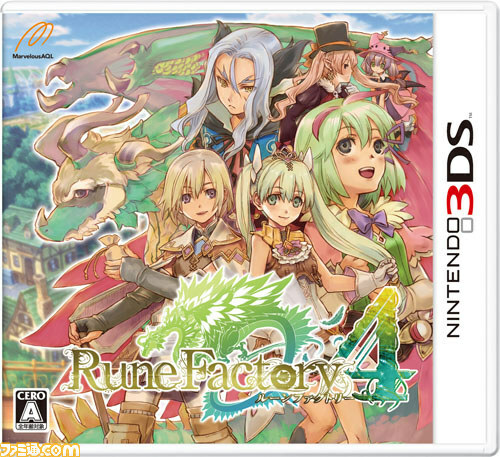 Rune Factory 4 allows the gamer to both pick up and play, and simply play for long periods of time. ← I know, another long hiatus. What's her excuse now? Butts. That's the excuse. Now I want this game and some turkey sandwiches. I think you should have both of those things in your life. Who says you can’t have both? I’ve always been really greedy that way. I want it all! This game is phenomenal! I love HM games, and decided to FINALLY try out a Rune Factory game. It’s too bad that the company closed:(…I am a girl ahaha and I have to say that I am a little disappointed that Arthur isn’t given much of a light in fandoms, or anyone who has played the game. Sure, he’s your typical kind person, but why do girls go for the ones that say “Get out of my face!” and only start to show respect after they like you? I understand the appeal, but in real life, if someone were to speak like that to you after RESCUING them, well, I’d avoid you. Anyways, I haven’t gotten too far, but what I have done is enough to make me praise this game and Xseed. All of the characters are complex and realistic, and I was astonished to discover that Arthur has a shocking secret of his own…his work is not what you think. Anyways, awesome review, and I found myself agreeing with everything you said!